• A major exhibition on painter JMW Turner’s fascination with the sea opens at the National Maritime Museum in Greenwich tomorrow. Turner and the Sea is the first “full scale” examination of the artist’s relationship with the sea and features works on loan from some of the world’s greatest art institutions. Highlights among the oils, watercolours, prints and sketches on show include The Fighting Temeraire (1839) (pictured), Snow Storm – Steam-Boat off a Harbour’s Mouth (1842), Staffa, Fingal’s Cave (1832), Whalers (1845) and Calais Pier (1803) as well as Turner’s largest painting and only royal commission, The Battle of Trafalgar (1824). The works are being exhibited alongside works by other notable British and European artists including Thomas Gainsborough, Willem van de Velde, Claude-Joseph Vernet and John Constable. Runs until 21st April. Admission charges apply. See www.rmg.co.uk for more details. 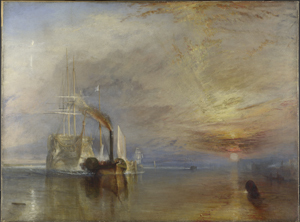 PICTURE: The Fighting Temeraire, tugged to her last Berth to be broken up, 1838 by JMW Turner, 1839, oil on canvas. © The National Gallery, London. • The ‘new’ Tate Britain was unveiled to the public this week following a £45 million upgrade and refurbishment and the house-warming party is on this weekend. The work has seen the oldest part of the Grade II* listed building in Millbank transformed thanks to architects Caruso St John and sees the main entrance reopened as well as The Whistler Restaurant, new learning studios an a new archive gallery as well as a new cafe and bar for Tate members. It’s unveiling follows the opening in May of 10 new galleries and new BP displays including the chronological presentation of the Tate’s collection of British art. The house-warming party, a free event, takes place on Saturday from 3pm to 10pm and features music, the giving out of free limited edition prints and a series of talks, film screenings, workshops and even a treasure hunt. For more, see www.tate.org.uk. • Hyde Park Winter Wonderland kicks off again tomorrow with highlights including the ice sculptures of ‘The Magical Kingdom’, the giant observation wheel, the ice rink and Santa Land. There will also be more than 200 chalets in the Angels Christmas & Yuletide Markets, the Bavarian village is back, and Zippo’s Circus will also be returning with a range of shows include Cirque Berserk for the evening crowd. 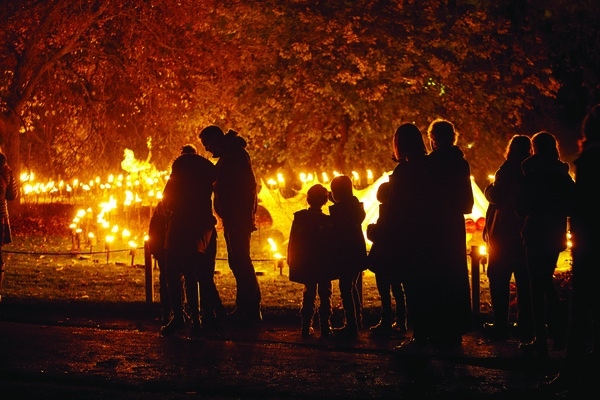 Entry is free but tickets for various attractions can be bought at www.hydeparkwinterwonderland.com. Runs until 5th January. • ON NOW: The Young Durer: Drawing the Figure. This exhibition at the Courtauld Gallery looks at the figure drawing of the young Albrect Durer (1471-1528), focusing on works created in his formative years between 1490-1496. Among the exhibition’s highlights is Mein Agnes (My Agnes), A Wise Virgin, and Three Studies of Durer’s left hand. The exhibition runs until 12th January. • A new exhibition celebrating the art of the Underground opens at the London Transport Museum in Covent Garden tomorrow. Poster Art 150 – London Underground’s Greatest Designs showcases 150 posters with examples taken from each decade over the past 100 years. Artists include the likes of Edward McKnight Kauffer, Paul Nash and Man Ray. The posters were selected from the museum’s archive of more than 3,300 by a panel of experts. Visitors to the exhibition will be able to vote on their favorite poster as well as online with the most popular poster to be revealed at the end of the exhibition. The last major exhibition of Underground posters – the first commission of which was in 1908 – was held in 1963 to celebrate the system’s centenary. The exhibition is based around six themes – ‘Finding your way’, ‘Brightest London’, ‘Capital culture’, ‘Away from it all’, ‘Keeps London going’ and, ‘Love your city’. Runs until 27th October. Admission fee applies. For more on the exhibition and surrounding events, see www.ltmuseum.co.uk. • The external facade of the National Gallery in Trafalgar Square was decorated with artworks last Friday night (pictured right) in celebration of the completion of Your Paintings – a website which hosts the UK’s entire national collection of oil paintings (more than 210,000!). 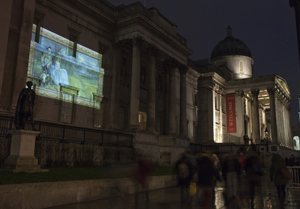 The projections – which were happening in 28 UK cities simultaneously – featured two National Gallery paintings – Van Gogh’s Sunflowers and Gainsborough’s Mr and Mrs Andrews. To see the website, head to www.bbc.co.uk/arts/yourpaintings/. PICTURE: © The National Gallery, London. • On Now: Becoming Picasso: Paris 1901. This exhibition at The Courtauld Gallery in Somerset House on The Strand tells the story of Pablo Picasso’s break-through year as an artist – 1901 – when the then 19-year-old launched his career in Paris at a summer exhibition. The display follows Picasso from his debut and into the start of his Blue period. Works exhibited are among the first to bear his famous signature. Runs until 26th May. There is an admission charge. For more, see www.courtauld.ac.uk/gallery/index.shtml. • On Now: Through American Eyes: Frederic Church and the Landscape Oil Sketch. This free exhibition of 30 works at the National Gallery focuses on the work of Frederic Church (1826-1900), a member of the Hudson River School of artists and considered by many to be the greatest of the American landscape oil sketch artists. Works on display include those made at exotic locations such as Ed Deir, Petra, painted in Jordan in 1868, and Distant View of the Sangay Volcano, Ecuador, painted in 1857, as well as the paintings created closer to home, such as Hudson, New York at Sunset, painted in 1867. The exhibition is held in Room 1. Runs until 28th April. For more see www.nationalgallery.org.uk. • A West End institution which has hosted a who’s who of Londoners – including the likes of Oscar Wilde, Arthur Conan Doyle, Rudyard Kipling and Winston Churchill as well as, more recently, David Bowie, Mick Jagger and Princess Diana – has reopened its doors to the public after a four year redevelopment. Originally opened in 1865 by French wine merchant Daniel Nicholas Thévenon and his wife Celestine, Café Royal at 68 Regent Street – overlooking Piccadilly Circus – has been relaunched as five star hotel featuring more than 150 rooms, six historic suites and a variety of dining venues – including the spectacular Grill Room – as well as a private members club, meeting rooms and wellbeing centre. 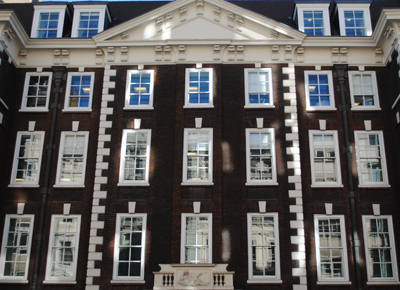 The redevelopment of this storied building, which centres on the original premises – retaining John Nash’s Grade I-listed facade, has seen the restoration of grand public rooms, originally dating from the 1860s and 1920s, as well as an expansion into neighbouring buildings – all under the watchful eye of David Chipperfield Architects and Donald Insall Associates. For more, see www.hotelcaferoyal.com. • One of six small hospitals set up by the Bloomsbury-based Foundling Hospital, the Barnet branch operated in Monken Hadley in west London from 1762-1768. It’s now the subject of one of two new exhibitions which opened at the Barnet Museum at the beginning of the month. The Barnet Foundling Hospital, Monken Hadley, 1762-1768, features a range of objects relating to some of the children placed in the hospital including identifying coin tokens left by mothers, and letters written by manager Prudence West. The exhibition initially runs until 14th January – after which objects will be replaced with prints – and then until 28th February. The second exhibition, Foundling Voices, is on tour from the Foundling Museum and features oral histories of some of the last people to be cared for by the Foundling Hospital in Berkhamsted which closed in 1954. This runs until 13th January. Admission to both is free. For more, see www.barnetmuseum.co.uk. • On Now: Constable, Gainsborough, Turner and the Making of Landscape. This exhibition, recently opened in the John Madejski Fine Rooms and Weston Rooms at the Royal Academy of Arts, features works of art by three “towering figures” of English landscape painting – John Constable, Thomas Gainsborough and JMW Turner. The 120 works on display includes paintings, prints, books and archival material. Highlights include Gainsborough’s Romantic Landscape (c 1783), Constable’s The Leaping Horse (1825) and Boat Passing a Lock (1826), and Turner’s Dolbadern Castle (1800). There are also works by their 18th century contemporaries and artifacts including letters written by Gainsborough, Turner’s watercolour box, and Constable’s palette. Admission charge applies. Runs until 17th February. For more, see www.royalacademy.org.au. • A new exhibition featuring some of London’s leading ladies of the eighteenth century opens at the National Portrait Gallery today. The First Actresses: Nell Gwyn to Sarah Siddons is the first exhibition devoted to eighteenth century actresses and features 53 portraits depicting the likes of Gwyn and Siddons as well as Lavinia Fenton, Mary Robinson and Dorothy Jordan. Highlights of the exhibition include a little known version of Joshua Reynolds’ portrait of Sarah Siddons as the “tragic muse”, William Hogarth’s The Beggar’s Opera and Thomas Gainsborough’s portraits of Giovanna Bacelli and Elizabeth Linley. The exhibition reveals the key role these women played in the celebrity culture found in London (and elsewhere) during the period. As a counterpoint, an accompanying exhibition displays photographs and paintings of some of today’s actresses. Runs until 8th January (an admission charge applies). For more information on the exhibition or the programme of accompanying events, see www.npg.org.uk. • Cemetery in Hackney and Kensal Green, a park in Hounslow and a Piccadilly property formerly used as the Naval and Military Club are among the “priority sites” listed on English Heritage’s annual Heritage At Risk Register. Released earlier this week, the register’s 10 London”risk priority sites” include London’s first metropolitan cemetery – Kensal Green (All Souls) – which dates from 1833, Gunnersbury Park in West London – featuring a large country home known as Gunnersbury Park House, it was built in 1801-28 and later remodelled, and a mansion at 94 Piccadilly – built in 1756-60 for Lord Egremont, it was later used at the Military and Naval Club and is now for sale. Others on the list include Abney Park Cemetery in Hackney – laid out in 1840, it is described as London’s most important Nonconformist cemetery, a medieval manor farm barn in Harmondsworth in London’s outer west, Tide Mill in Newham, East London, and the entire Whitechapel High Street and Stepney Green conservation areas. For more information, see www.english-heritage.org.uk/caring/heritage-at-risk/. • On Now: The Heart of the Great Alone: Scott, Shackleton and Antarctic Photography. Opening at the Queen’s Gallery, Buckingham Palace, tomorrow, the exhibition marks the centenary of Captain Robert Scott’s ill-fated expedition to the South Pole and features a collection of photographs presented to King George V by the official photographers on Scott’s expedition of 1910-13 and Ernest Shackleton’s expedition of 1914-16 as well as unique artifacts including the flag given to Scott by Queen Alexandra (the widow of King Edward VII) which was taken to the Pole. Highlights include Herbert Ponting’s images The ramparts of Mount Erebus and The freezing of the sea and Frank Hurley’s stunning images of Shackleton’s ship Endurance as it was crushed by ice. Runs until 15th April, 2012 (admission charge applied). For more, see www.royalcollection.org.uk.